Verfasst von pw am Do, 10/20/2011 - 21:28. Orientalism refers to the imitation of aspects of Eastern cultures in the West, and was devised in order to have authority over the Orient. The concept of Re-Orientalism maintains the divide between the Orient and the West. However, where Orientalism is based on how the West constructs the East, Re-Orientalism is grounded on how the cultural East comes to terms with an orientalised East. 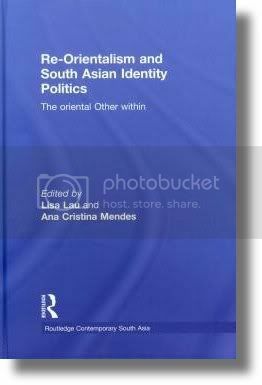 This book explores various new forms, objects and modes of circulation that sustain this renovated form of Orientalism in South Asian culture. The contributors identify and engage with recent debates about postcolonial South Asian identity politics, discussing a range of different texts and films such as The White Tiger, Bride & Prejudice and Kama Sutra: A Tale of Love. LISA LAU is Head of Human Geography at Keele University, UK. Her research interests include post-colonialism, literary studies, gender studies, and South Asia, encompassing the issues of power, narrative, identity construction, class chasms, social and cultural change. Profile page. ANA CRISTINA MENDES is a researcher at ULICES (University of Lisbon Centre for English Studies) in Portugal. Her research interests span postcolonial cultural production and its intersection with the culture industries. Profile page.